It’s virtual Thursday, y’all! For my fellow 9-5 office workers, you likely understand that term. It’s also known as virtual Friday eve. Virtual Thursday is so much better than real Thursday, because it means your work week got trimmed down to a reasonable 4 days and you’re about to have some extra time in your weekend sooner than usual! For me it’s because I’ll be spending real Friday out of town at my Grandma’s house for one of our annual summer canning days! Green beans are on the menu this week and if I’m lucky I’ll also be picking some fresh produce and flowers to bring home with me! Who needs farmers markets? Kidding. I do. Two hands raised. I loooove farmers markets. The atmosphere is totally my jam. Now if I wanted to find a way to tie this in to the recipe of this post I’d tell you this oven fry mix is delicious on porky chops and pairs extremely well with mashed potatoes and green beans! Before I got into homemade alternatives, I bought Kraft Oven Fry for Pork semi-regularly and happily enjoyed it with each dinner. It’s really yummy and could hardly make cooking easier so my twenty through twenty-seven year old selves thought win win! Then everyone started talking about healthy foods, understanding what you’re eating and reading labels. This is a good thing and we should definitely be conscious of what goes in our bodies, but I’m guilty of majorly overthinking food and stressing about it, which just so y’all know will practically cancel out your “awesome” eating habits. So what I recommend is don’t follow a super strict diet (unless directed for medical reasons), eat and drink more good (nutrient dense) than bad (empty calories), relax your mind and make this oven fry mix instead of the store bought version, because we can all agree high fructose corn syrup doesn’t need to be on pork and chicken! Plus it tastes fresh and even acts as decor in a cute container on your kitchen counter or in your pantry! 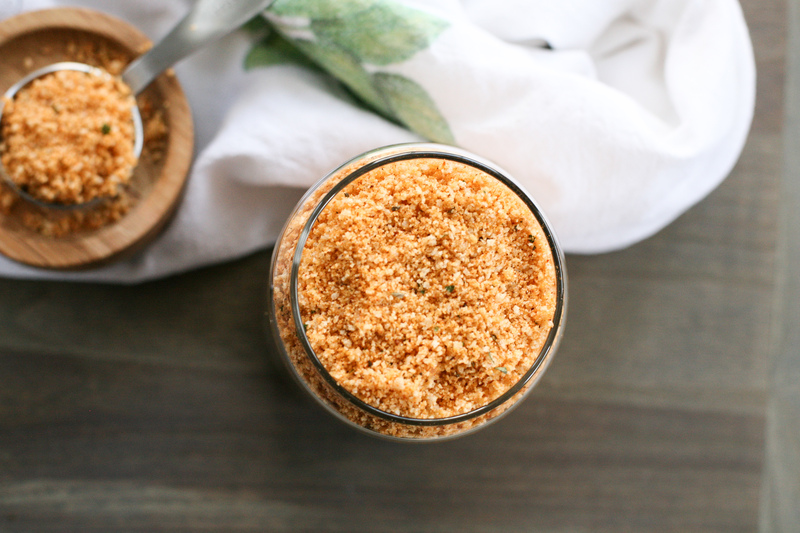 To be extra impressive, you can even make your own breadcrumbs and really call this recipe made from scratch. Absolutely something my Grandma would do. In other news, things are moving right along with our new house and we are still on track to move in mid-September! (Don’t tell our builder I told y’all that; he said that’s if everything goes perfectly and if I start sharing specific dates he’ll deny he communicated them haha) It’s really been a fun experience though. This week is a big one – They’re completing the siding and shutters, pouring cement in the basement, garage and front porch, walking through electrical inspections and beginning the insulation and drywall! For all the tiny details check out my New Home Build tab and follow along (but please note I’m working on catching up :)) Sneak peak though? Okay, but just of my favorite room! The container holding the oven fry mix is super cute. You can get it from the Container Store here! The perfect seasoning for your pork chops! Add all ingredients to a large mixing bowl and combine well. Store in a dry, cook location in an airtight container for 1-2 months or cut recipe in half and make as needed. Enjoy! Pat pork chops or chicken dry. Drench meat in whisked egg or melted butter and then coat with oven fry mix. Place on a parchment paper covered baking sheet and bake in a 350 degree oven for 30 - 40 minutes, until appropriate internal temperature has been reached. This entry was posted in Homemade Alternatives, Recipe Book and tagged chicken, easy dinner, homemade, homemade alternatives, oven fry, oven fry mix, pork chops, weeknight meals. Bookmark the permalink. This is Italian BREADING. NOT OVEN FRY. However my husband liked it.